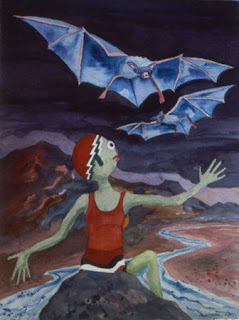 Today a man visiting Sebastopol Gallery admired this watercolor painting of Changing Woman & the Blue Bats. He'd been looking intently at the seven mushroom watercolors I have displayed here, noting that his son is a mushroom enthusiast who also quotes Paul Stamets. When he moved his attention from mushrooms to bats, I remarked that as an ecology nut, I often celebrate the essential beings that people tend to forget. Bats may not be as essential to the health of all life as mushrooms, but they're high on the list of neighbors who benefit the rest of us. I'm always delighted when I see one, & wish I could see hundreds, as I walk along the Laguna de Santa Rosa in the evening light. The irony of losing bats (& swallows!) in the process of chemical "mosquito control" coils anger & sadness in my belly. In this painting, Changing Woman sits on a rock that divides a river curing away into the distance. 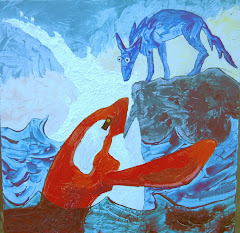 Two blue bats approach: are they bringing a message from the dark beyond? I certainly believe that the presence, abundance or absence of bats is a good indicator of the health of an ecosystem, especially any habitat with a significant water feature. Bats are also associated with the death & rebirth needed for shamanic consciousness. We may need to die to many "needs," to be reborn to generous love, willing to share "resources" with other species. You could imagine bats as ecosystem messengers, intimate with the consciousness we need to comprehend & value the complexity of life around us. Guided by their echolocation, we may sound out in the darkness the path to what really sustains us, & how to sustain it in return. I feel a certain awe and admiration about bats and mushrooms. I also feel that way about snakes. It's funny, when I was a little boy I feared all three in varying degrees. That fear has transformed, I guess largely through curiosity and investigation.